A new tube map was released yesterday. Normally it takes me ages to find one, but the invisible staff at Bromley-by-Bow had dumped a stack on the shelf outside what used to be the ticket office, so I grabbed one on day one. There is of course some new art on the cover. Dutch artist Lily van der Stokker has drawn some text in pastel-shaded boxes to create "an observation of the stolen moments between strangers on the Tube". This is the kind of art which makes art critics write stuff like "Written in the first person and using language that is informal, she creates a kind of intimacy for a commission which is small in scale but vast in reach. The text ends ‘I know where I am going’, and through her apparent simplicity van der Stokker subverts our assumptions about our individual journeys." It's also the kind of art that tends to make anonymous grumpy men write "I don't like it I could have drawn it what a waste of money" in the comments box. If you manage to find a night tube map there's a stuffed gorilla in a Hawaiian shirt on the front of that, which is obviously more exciting. 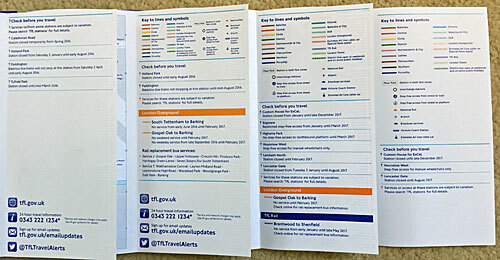 But what readers of this blog will really want to know is, has anything changed on the tube map itself? Why yes it has. Lots of stuff which used to be shut has reopened. The Gospel Oak to Barking line reopened in February, and the new tube map finally shows this. Lambeth North station reopened in February, and the new tube map finally shows this. Two restrictions to step-free access ended in March, so they've been cleared off. Long term engineering works between Brentwood and Shenfield have just finished, so that's gone back to normal too. In addition there have been several changes to accessibility blobs - and we discussed that last month. So I thought this might be a good moment to consider the evolution of the information panel on the tube map. Here are the information panels for the last four tube maps, from January 2016 through to May 2017, starting with the blankest column of all. The second map was when the tram first appeared, so the key to all the lines was moved off the map proper and stuck down the side, plus the Overground closures started, taking up more room. 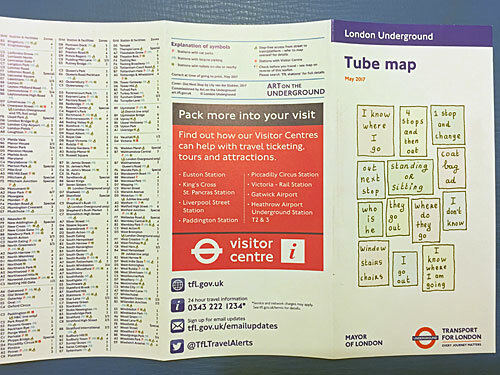 On the December 2016 map the Overground information shrunk, and someone stuck all the contact details on the back cover, creating space to make the key a bit larger. On the latest map the key is the largest it's ever been, better spaced and with all the symbols in one long list, which is much more legible. The font size is still eye-wateringly tiny, but the extra space definitely helps. Meanwhile, this latest version has hit a new low in the number of blue daggers on the map - there are only three! One's a long-term step-free access issue at Hounslow East, one's at Lancaster Gate station which is closed until August, and the other's at Custom House station which is closed until December. Mysteriously, Lancaster Gate isn't 'crossed out' on the map, whereas Custom House is, which is oddly inconsistent given that both are shut for at least the next three months. Alas there are still seven red daggers on the map, a symbol which means "we can't be bothered to tell you what the issue is at this station, get your phone out and search for it, if you can be bothered." Amongst the invisible information imparted by these red daggers is "exit only on Sunday afternoons", "not served by trains in one direction", "no trains except very early or very late" and "only half the trains stop here". Some of this is important stuff people ought to know, but not even the enormous printed map in tube stations tells passengers what the red daggers mean, and searching online is ridiculously inefficient. Worst of all, even if you follow the red dagger instructions on the tube map and search for "TfL stations", you won't find out what the special information actually is. Each of the station webpages used to have a box explaining what the problem was, but they've all disappeared in an unhelpful mismatch between printed and digital data. The Camden Town page says nothing about access on Sundays, the Cambridge Heath page says nothing about half the trains not stopping, the Goodge Street page says nothing about whatever the newly-created issue might be, etc etc etc. The map designers have expunged the information from the map, and the website designers have deleted the information from the web, and consequently the red daggers are now entirely meaningless. Perhaps they'll print all the important information on the map next time. There's plenty of space.